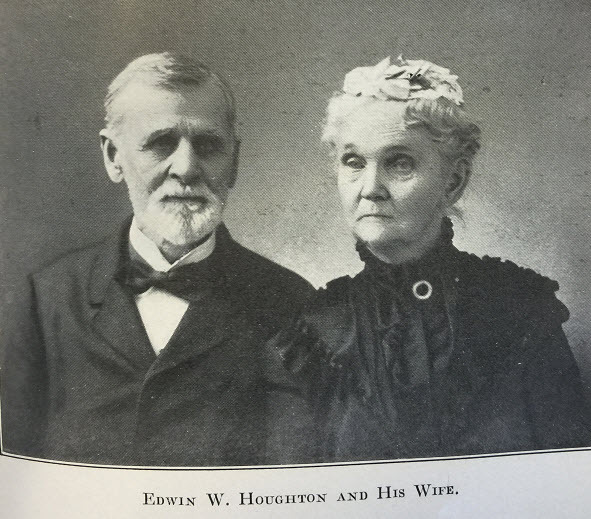 Edward F. Houghton married Emeline Frazer. Annie Elizabeth Davidson Dawson married Frederick Edward Smith Houghton, son of Clark Houghton and Fanny Smith. Edwin T. Butler married Sarah Smith Houghton, daughter of Clark Houghton and Fanny Smith, in circa Feb 17, 1855 at New York, New York Co., NY, USA. Caroline Graves Anthon married Rev. 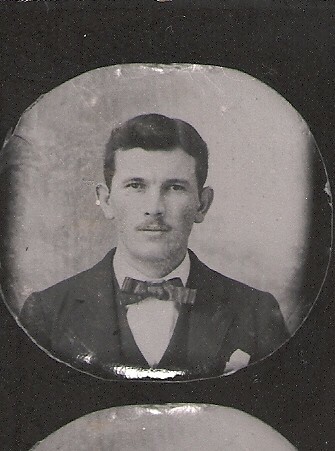 Dr. George Hendric Houghton S.T.D., D. D., son of Clark Houghton and Fanny Smith. Emeline Frazer married Edward F. Houghton, son of Clark Houghton and Fanny Smith. Sarah Houghton Bowen married John Springer in Sep 3, 1845. Sarah Houghton Bowen married James Wakeman Redfield w/2. John Springer married Sarah Houghton Bowen, daughter of Charles Bowen and Esther Smith Houghton, in Sep 3, 1845. James Wakeman Redfield married Sarah Houghton Bowen, daughter of Charles Bowen and Esther Smith Houghton, w/2. Gertrude Redfield married Otto Colburn in Jan 2, 1882. Otto Colburn married Gertrude Redfield, daughter of James Wakeman Redfield and Sarah Houghton Bowen, in Jan 2, 1882. Augustus Emory Houghton married Miss (?) Cole. Augustus Emory Houghton married Wealthy L. (?) in circa 1886 mar 14 y in 1900; also mar 34 & 33. Miss (?) Cole married Augustus Emory Houghton, son of Emery Augustus Houghton and Louisa E. Perry. Lydia Pamelia Houghton married William Barnard in Sep 28, 1848. Edward Fitch Houghton married Margaret Baird in 1868. Calista Houghton married Charles Edward Wales in Jul 18, 1859. Abigail Houghton married Marcus Barbour Kenyon. Harriet Houghton married John Russell Chamberlin in Jun 21, 1843. 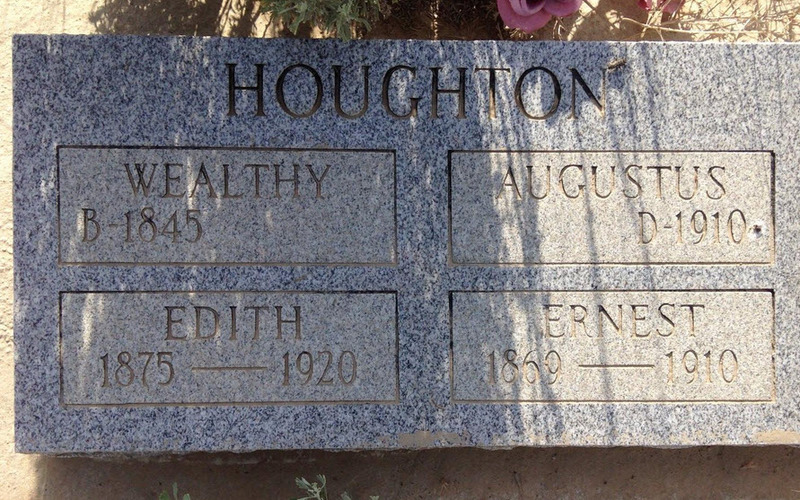 Edwin Wells Houghton married Eleanor Jane Daugherty in Jan 5, 1839 Barber: Mar 5; mar 61 years in 1900 census. Marcus Barbour Kenyon married Abigail Houghton, daughter of Nehemiah Houghton Jr., Esq. and Calista Clark. 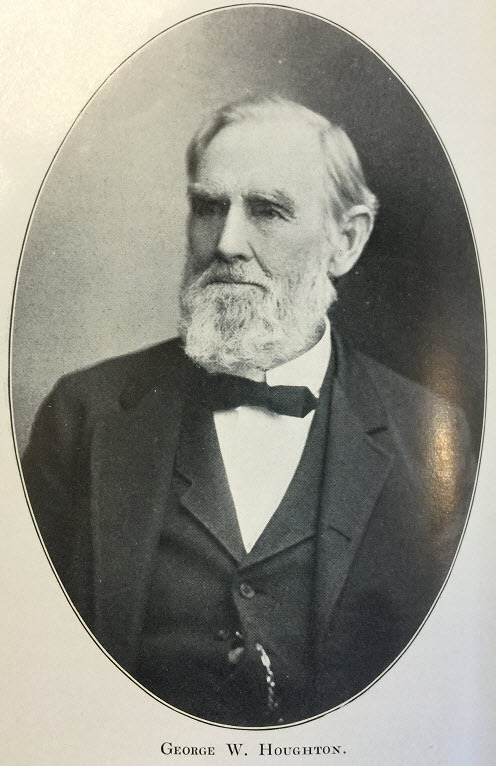 John Russell Chamberlin married Harriet Houghton, daughter of Nehemiah Houghton Jr., Esq. and Calista Clark, in Jun 21, 1843. William Barnard married Lydia Pamelia Houghton, daughter of Nehemiah Houghton Jr., Esq. and Sabrina Thayer, in Sep 28, 1848. Margaret Baird married Edward Fitch Houghton, son of Nehemiah Houghton Jr., Esq. and Sabrina Thayer, in 1868. Harry Houghton married Johanna O'Hern in Oct 28, 1896 at Sioux City, IA, USA, mar 16 y in 1910 census. Charles Edward Wales married Calista Houghton, daughter of Nehemiah Houghton Jr., Esq. and Sabrina Thayer, in Jul 18, 1859. Clara Wales married Frank Denning Stout at Dubuque, IA, USA. Frank Denning Stout married Clara Wales, daughter of Charles Edward Wales and Calista Houghton, at Dubuque, IA, USA. George Wellington Houghton married Susan Moe Close in Oct 21, 1841 mar 58 years in 1900 census. Asa Willard Houghton married Ann Knowlton in Mar 9, 1843.